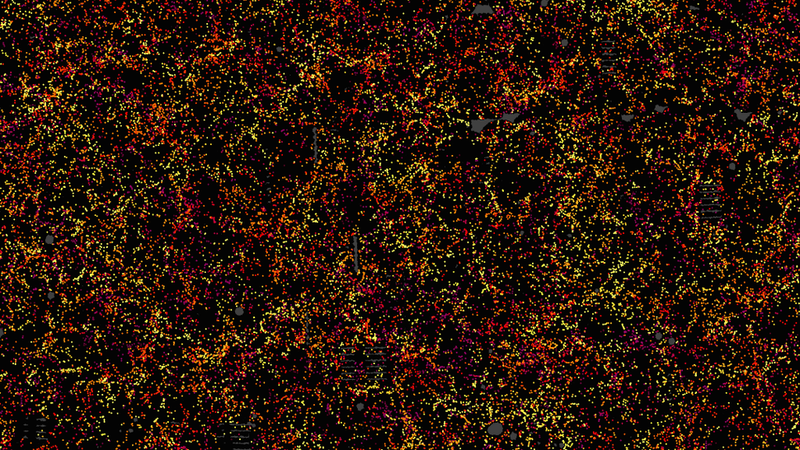 The astronomical map you see here doesn’t depict stars, it shows galaxies—1.2 million of them, to be exact, a new record for astronomers. This extraordinary new 3D scan of the universe provides yet more evidence that a mysterious substance known as dark energy is likely causing the universe to expand at an accelerating rate. The map encompasses 650 cubic billion light-years of space—about a quarter of the sky—and required the work of hundreds of scientists from the Baryon Oscillation Spectroscopic Survey (BOSS). BOSS is a program within the Sloan Digital Sky Survey III (SDSS-III) that measures the sound waves of the early universe, which left faint imprints on the cosmic background radiation—the “afterglow,” as it were, of the Big Bang. They also left their imprints on the distribution of galaxies, which is what BOSS is using to map the positions and distances of galaxies back through time. And the new map is not just a pretty cosmic picture. It provides one of the most precise measurements of the expansion of the universe to date, and confirms a leading explanation for the dark energy physicists believe is driving that expansion. When Albert Einstein first proposed his general theory of relativity in 1916, he didn’t know the universe was expanding. Like everyone else at the time, he thought the size of the cosmos was fixed, and the only way he could get the equations to work for a static universe was by introducing a mathematical fudge factor he dubbed the “cosmological constant,” symbolized by the Greek letter lambda. Without it, the universe would have either contracted or expanded. Einstein had to revise this idea when American astronomer Edwin Hubble discovered in 1929 that the universe really was expanding. Einstein called it the biggest blunder of his career. Then, in 1998, two teams of physicists studying supernovae found that not only are distant galaxies receding from us, they are doing so at a faster and faster rate. To account for this, physicists proposed that the cosmos is filled with dark energy, although they aren’t sure precisely what this is. One of the most promising explanations is that Einstein was on the right track when he proposed a cosmological constant—except now, instead of keeping the universe static, it serves as a kind of counter force against gravity, driving the universe to expand at an ever-accelerating rate. The data collected in the BOSS survey—which had to factor in the rates at which galaxies are moving—strongly affirms this model. The colors indicate relative distance from Earth, where yellow objects are the closest, and purple objects the furthest. Grey patches are small regions where no data exists. Galaxies appear to be highly clustered, revealing superclusters and voids. Let’s put this image into perspective. For the sake of argument, let’s say that each galaxy contains an average of 100 billion stars. At about 48,741 galaxies, that represents approximately 4,874,100,000,000,000 (4.8741 × 1015) stars, or 4.8 quadrillion stars. And that’s just this portion of the map, which represents 1/20th of the total survey. Taking the entire map into account, that’s nearly 100 quadrillion stars— a one followed by 18 zeros. The image above shows a segment of the universe in three dimensions. The rectangle on the left shows a cut-out of 1,000 square degrees in the sky containing nearly 120,000 galaxies, or roughly 10 percent of the total survey. Brighter regions correspond to more galaxies. “We see a dramatic connection between the sound wave imprints seen in the cosmic microwave background 400,000 years after the Big Bang to the clustering of galaxies 7 to 12 billion years later,” BOSS co-leader Rita Tojeiro, of the University of St. Andrews, said in a statement. The BOSS data shows that dark energy—which drives cosmological expansion—is consistent with the cosmological constant with an error of only five percent. This map is also fully consistent with the standard cosmological model (in which the universe contains a cosmological constant), adding further weight to this prevailing scientific theory. Moving forward, cosmologists can use this information to better understand the precise mechanics behind dark energy.